XGlass, the $299 First Mobile AR Theater in the United States, is the First Mobile Phone Tethered AR Theater in the World. MILPITAS, CALIFORNIA, USA, February 21, 2019 /EINPresswire.com/ — "XGlass, the $299 First Mobile XR Theater in the United States, and the First Mobile Phone Tethered XR Theater in the World, is your 30-foot Semi-Immersive 3D IMAX On-The-Go, with total privacy protection", says Sam Yuan, CEO of iGlass USA inc.
iGlass USA inc, an advanced technology company in Silicon Valley, is making affordable, sociable, 130g feather-light, palm-sized XGlass, tethered to your phone by a single USB-C cable, providing an total-privacy 30-foot gigantic screen with super sharp and vivid image, for Best Mobile Viewing of YouTube, Netflix, Comcast, Roku, ESPN Sports Live Streaming, 3D Avatar, Victoria Secret Fashion Show, Twitch, Facebook Video etc., in College Dorm, on Airplane, Train, Bus, 2nd Row of Car or at Home. As the Entertainment industry clearly trending towards mobile and online streaming, iGlass USA inc is providing 30-foot huge screen, total privacy protection, online streaming ready XGlass to meet people’s personal entertainment needs on the road or at home. "We clearly see the trend in the industry, iGlass USA is here to be the pioneer for the upcoming 5G era. iGlass USA has unique novel technologies to deliver giant screen with super sharp image, accurate color and total privacy, yet the technology is very affordable. Comparing to other expensive AR headsets like the Microsoft HoloLens or Magic Leap One, with price stickers well over $2000, XGlass is priced at $299, just a fraction of those AR headsets out there. At $299 consumer price point, I firmly believe all other AR players will have a hard time to compete with XGlass", says Sam in a recent talk. “Unlike streaming on your Phone, PAD or TV, where others can easily spot what you are watching, XGlass projects the content directly to your retina, so you are the only person who can see the 30-foot huge screen in front of you. You could well be watching your favorite Victoria Secret Fashion Show without concerning your next seat neighbor on the airplane knows what you are enjoying. This type of experience is what we called Total Privacy protection on XGlass”, says Sam. 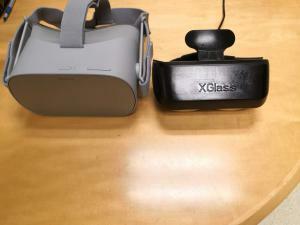 “Unlike VR devices such as Oculus Rift, XGlass does not create social isolation, you can eye contact with people around. 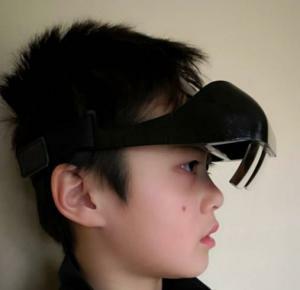 Since you can directly see the environment, wearing XGlass in public places are safe, without the type of risks like bumping into others, etc.”, says Sam. “Also, all VR gadget suffer from the notorious VR motion sickness, which happens when your eyes tell your brain you’re moving around in a virtual environment, but your body feels like it’s standing still, such conflict caused dizziness is the Achilles heel of all VR devices. 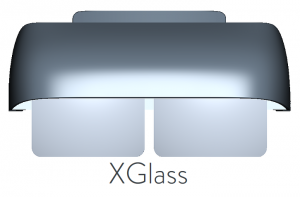 On the other hand, since XGlass allows you directly seeing the stable environmental background, it is motion-sickness-free, which is a major advantage of XGlass”, Sam adds. “XGlass is amazingly comfortable to wear, it is less than one third the weight of most AR VR gadgets out there today (i.e., the Sony PlayStation VR measured at 683g, the latest Oculus Go VR measured at 487g, HoloLens Measured at 550g). At 130 grams feather light weight, XGlass Mobile theater has reach the point for all day long wearing, even for minors. And you can wear your daily prescription glasses at the same time, very convenient”, says Sam. “To me, this small, lightweight, sociable, total-privacy 30-foot giant screen, motion-sick free gadget could have important business applications too. Imagine all Airlines start adding the 130-gram, palm-sized XGlass on each of theirs seats, replacing the heavy and small 10-inch screen LCD based entertainment systems current out there on the airplanes, the weight and space saving on the airplanes simply equals $$$ saving for the Airlines, for each trip. More importantly, XGlass' private 30-foot giant screen brings invaluable user experience on the road, making the trip a pleasant relaxation period for the passengers. I would guess all Airplanes have to adapt to XGlass sooner or later, as going Giant-Screen experience is the trend and no business can against the trend,” said Sam. "If you want to learn more about iGlass, in this 1.2 million people watched Video, Linus Tech Tips provided a detailed introduction on iGlass USA inc's display technology," continues Sam. PITTSBURGH, PA, UNITED STATES , February 21, 2019 /EINPresswire.com/ — The Hospice and Palliative Nurses Association is pleased to announce the appointment of Marika Haranis, MSN, CRNP, ACHPN, as its new Chief Clinical Officer. Her first day with the organization was Wednesday, February 20, 2019. In this role, Ms. Haranis will lead education and research programs and represent HPNA in advocacy efforts. Ms. Haranis comes to HPNA from UPMC Altoona, where she was the Clinical Director of Palliative Services, Transitional Year Residency Coordinator, Program Coordinator / Palliative Fellowship Coordinator, and a Nurse Practitioner since 2014. She served as a Hospice Clinical Practitioner at UPMC Family Hospice and Palliative Care, a Clinical Practitioner at the Minute Clinic in Washington, DC, and was a Staff Nurse at the Robert Wood Johnson University Hospital in New Brunswick, N.J. Ms. Haranis is an End-of-Life Nursing Education Consortium (ELNEC) Trainer, a POLST Train-the-Trainer, and Pallitalk Trained by AAHPM. She is a member of HPNA and the American Association of Nurse Practitioners, UPMC Preceptorship Academy, UPMC Altoona Graduate Medical Education Committee, and the UPMC Altoona Ethics Committee. She is also a Beckwith Institute Grant Recipient of the Palliative Nurse Champion Program, won the UPMC Graduate Medical Examination Team of the Year and Rookie of the Year as well as the UPMC Altoona Guardian Angel Award. Ms. Haranis earned a Master of Science in Nursing: Family Nurse Practitioner and a Bachelor of Science in Nursing from Rutgers, The State University of New Jersey, and a Post Masters Certificate as an Acute Care Nurse Practitioner at the University of Pennsylvania. She is currently working on her Doctorate of Nursing Practice in Health Systems Executive Leadership at the University of Pittsburgh. “We are very excited to have Marika join our executive leadership team. Her skills as an expert palliative care clinician, in conjunction with her leadership experience in healthcare, will serve as a great complement to our team as we continue to advance our mission ‘to advance expert care in serious illness,’” said Sally Welsh, MSN, RN, NEA-BC, and CEO of HPNA. HPNA is a national nonprofit organization of nursing professionals practicing in the specialty of palliative nursing across the life span continuum. With a mission to advance expert care in serious illness, and more than 11,000 members, it is the only nursing organization of its kind. HPNA and its two affiliated organizations, the Hospice and Palliative Credentialing Center and the Hospice and Palliative Nurses Foundation, have a vision to transform the care and culture of serious illness. To learn more, visit HPNA at advancingexpertcare.org. 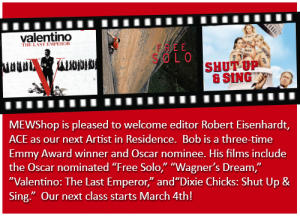 About Robert Eisenhardt, ACE: Bob Eisenhardt is a three-time Emmy Award winner and Oscar nominee. With over 60 films to his credit, he has edited documentaries for Barbara Kopple, Maysles Films, Susan Froemke, Matt Tyrnauer, Marc Levin, David Grubin and Alex Gibney. Recent films include the Oscar-nominated “Free Solo,” “Outside the Bubble: On the Road with Alexandra Pelosi,” “Wagner’s Dream,” which received an Emmy nomination for editing, “Valentino: The Last Emperor,” “Dixie Chicks: Shut Up & Sing,” “Living Emergency: Stories of Doctors Without Borders,” “Dancing in Jaffa,” and the HBO film “Everything Is Copy” on the life of Nora Ephron. The post-production industry is highly competitive, and knowing the industry standards – Premiere Pro, After Effects and Avid Media Composer – is critical for success. MEWShop offers in one comprehensive, six-week course all of these editing applications, taught by certified instructors. No other program guarantees more time in the classroom or more working on one’s own computer. The Six Week Intensive Course will take students through each program as they work on various real-world projects to illustrate the distinct strengths and nuances of each NLE software. MEWShop’s Six Week Intensive is the only course of its kind that allows students to choose the footage they want to edit on the platform they prefer. This program also is the only Six Week program where students can have the opportunity to become a Certified Avid User, through certified training and exams. 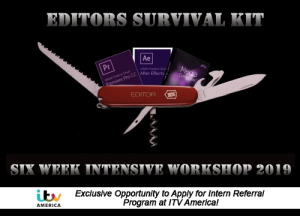 Beyond the creative and technical aspects of editing, a portion of the Six Week Intensive Course is focused on the best strategies to secure a job once the class ends. Students will draft cover letters and resumes, which will be refined over the span of the class, and also discuss with instructors interview strategies and job applications, as well as how to appropriately set rates and find the right work for each graduate’s unique interests. The next installment of MEWShop’s Six Week Intensive Workshop begins on March 4th, 2019 and held Monday through Friday from 10 AM – 5 PM. For more information on MEWShop’s Six Week Intensive Workshop or to register, please visit https://www.mewshop.com/six_week_workshop/overview/. 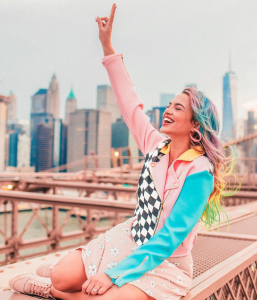 ORLANDO, FLORIDA, UNITED STATES, February 21, 2019 /EINPresswire.com/ — The Brazilian Youtuber Anna Layza is one of the most relevant digital influencers in her country, but not only there. She has a legion of fans around the globe, and more than 6.5 million subscribers to her "Hi Gorgeous" YouTube channel. She also has the world's largest unicorn-themed online store, ounicornio.com. 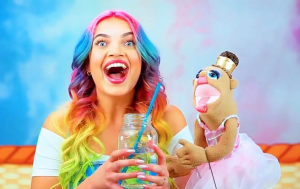 Anna also bets on children's segment, with her channel "Anna Layza Kids", featuring versions of popular songs in Portuguese, English and Spanish. However, it may be just the beginning of her successful journey on the internet and also as an entrepreneur. Precursor of the so-called "wave of unicorns”, which has reached people of all ages, including celebrities in Brazil and abroad, Anna talks to people from everywhere, and became one of the world’s most influent people in her segment. She lives in the United States, in Florida, but her followers, called “Unis", are from all continents. Anna Layza, (a.k.a "Queen Uni”) reached more than 300 million views on YouTube, and it’s still getting bigger. Recently, Anna Layza went through the nightmare of having all her accounts and social media profiles invaded. She couldn’t login and almost lost access to her accounts for good, and her millions of fans got worried about it. But, fortunately, she’s back again. Anna Layza tells us in an exclusive interview about the drama she lived, her personal life and what she’s up to in 2019. Tell us a little bit about all you've experienced with the invasion of your accounts. How your fans' reacted to the sudden disappearance of your content on the internet. What's it like to be back? Those were very difficult days. I was very scared and afraid of losing everything I’ve posted along all these years. But my greatest concern was seeing the Unis suffering because of my absence. I got very disappointed. Even sad and very shaken, I never stopped believing that everything would work out in the end. And I owe it to the Unis. Being back is wonderful! It is like to be sure once again that everything is possible when you believe; surely it is the divine justice and a proof that God is always looking out for us all. Your fans are your biggest supporters. How important to you is the motivation you’ve been receiving from them? Oh, I'm so grateful for my Unis. They have made and have been making all the difference in every phase of my life. Their unconditional, pure and positive love is able to recharge my battery, and give me energy to go on. I wouldn’t get here if weren't because of all of them. Everything I do, it’s because of them, always with love and a grateful heart. There are so many projects in my mind for 2019. Some will take a little longer to happen, due to all the inconveniences I've been through on this last month, but by now, I can tell you that we will launch another channel on YouTube, the "Pretend Play By Anna Layza”, for my US fans. The "Hi Gorgeous" channel will have now playful content in versions of "cool" stories, in parallel with the contents of the channel. We will also have the 5th edition of the UNICORNIO PARTY. We’re also developing an app for mobile and a new and improved layout for the online store oUnicornio.com. What can we expect for Anna Layza Kids this year? What are your expectations for this year? I love making videos for the Anna Layza Kids channel. People don't know, but one of my hobbies is singing! The expectation for the channel are the highest. I already have been working a lot on it. Our goal is to upload more videos there, with content that brings bring joy, knowledge and culture to children using the music. It's a channel with content approved for all audiences. Let's sing, learn and play a lot. That's my desire. 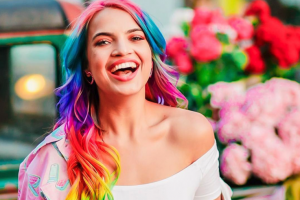 Today you are one of the children’s top influencers in Brazil and one of the most relevant digital influencers in the world in the theme of unicorns. How did you get here? Tell us about your journey towards your dreams. I use to say that the UNIS are the ones who chose me, and being able to be myself and doing what I really love is something sensational. The channel came about 3 years ago, when I moved from Boston to Windermere, Florida, in 2015. I thought it’d be nice to record some videos in Portuguese about my life outside Brazil, and then channel came out like this. I started to record videos because I missed my years as a model and my former career. So, my videos had tips for my friends, I shared my things, and my world on the social networks. Until the day I decided to post it on YouTube and I began to attract with my content an audience that I did not even imagine they'd be interested on me. For those who look from the outside, everything in my life may seem very simple, easy, colorful, because people do not have the opportunity to know my history and the way until here, the backstage of our lives. But I would say it all started when I was a teenager and I came to the United States to study. I did many things in my life until the launching of the YouTube channel. I worked as a manager of a coffee shop and a pizzeria in Rhode Island. I worked as a model, doing photo shootings and fashion shows. I also worked with photography. Then, one day, spontaneously, I started to share on Snapchat the things I love, my colorful unicorn world, travel advices and how is life outside Brazil, and then I got the sympathy of people, and the number of my followers started growing. Everything else came as a consequence of this. River Therapies has added the FDA-cleared I-PAS™ to their practice as part of their River Concussion Group. I-PAS provides a range of OVRT tests and exercises. PITTSBURGH, PA, US, February 21, 2019 /EINPresswire.com/ — River Therapies proudly announces they are the first physical therapy clinic in the Pittsburgh area to add an I-Portal ® Portable Assessment System (I-PAS™) to their practice. The I-PAS, developed by Neuro Kinetics, Inc. (NKI), is a game-changing, neural functional assessment tool. It is portable, FDA-cleared, and looks much like a virtual reality system. River Therapies can now offer an extensive battery of Oculomotor (eye movement), Vestibular (balance) and Reaction Time (or OVRT) tests and exercises to help the professionals at River Therapies address a multitude of injuries such as concussions. Over the last 19 years, River Therapies has grown to now offer a variety of services including physical therapy, occupational therapy, psychology, and social work. Founder and Director Cherie River became a speech therapist after her nephew was diagnosed with Down’s Syndrome. Her passion to help those as challenged as her nephew now encompasses: River Therapies, River Pediatric Therapies, River School Therapies, and River Concussion Institute. These practices treat adults, adolescents, and children in schools, homes, and clinics across the Greater Pittsburgh region. The clinic will use I-PAS as part of its newly formed River Concussion Group, to address the needs of adult to school-aged children who suffer from mild traumatic brain injury (mTBI). River explained that their goal is to bridge the gap between clinic, schools, and work by creating a process that addresses all aspects of concussion treatment and rehabilitation. River Concussion Institute is unique in the sense that they incorporate speech therapy, occupational therapy, physical therapy, psychology, and counseling into the concussion treatment program as needed per patient. River does not consider the concussion as an isolated event, but rather looks at entire function of the person so that they can start enjoying life again! “Our experience has taught us how to assess and clinically integrate new technologies. Being the first to integrate I-PAS into our clinical practice provides our patients with the most clinically advanced, neuro-functional assessment tool, allowing River Concussion to design and implement the most appropriate and beneficial treatment possible for our clientele ” said River. “We are going to use it for baselines, for rehabilitation, and for post-treatment and post-season assessments.” She went on to explain that, having observed I-PAS first hand, nothing else provides the insight and neuro-functional measurements that Rivers Concussion and its clientele will be able to get with I-PAS. This puts Rivers’ practitioners in a unique position to design and implement the most powerful treatment plans. Dr. John Schneider, a Physical Therapist at River Therapies, echoed River’s excitement about the inclusion of I-PAS in their treatment plan. "I couldn't be more excited to use the I-PAS system,” Dr. Schneider said. “It is especially valuable to me as I now have a way to determine if the interventions I choose for my patients are effective, or if I need to try a different approach. Our top priority is getting our patients better and back to doing what they love, and now we have a tool to let us know when and how we are achieving that goal." The objectivity of the data the device provides was also cited as a key benefit in comparison to alternative assessment tools, which are complementary and will be used when indicated to provide additional insight into a patient’s health condition. NKI has supplied comprehensive neuro-functional diagnostic and assessment tools to professionals around the globe for more than three decades. The U.S. Food and Drug Administration (FDA) cleared fourteen oculomotor, vestibular, and reaction time tests on NKI’s I-PAS in November 2017. Since then, a series of exciting developments have taken place including Indy Racing League’s, LLC (INDYCAR), announcement to include I-PAS as part of their concussion evaluation protocol. Also, in June 2018 it was announced that NKI’s I-Portal™ technology, including I-PAS, was used to test and confirm inner-ear damage suffered by U.S. Diplomats to Cuba. Neuro Kinetics, Inc. (NKI) is the leader in clinical eye tracking and non-invasive neuro-functional diagnostics and monitoring. Abnormal eye responses have been connected to more than 200 diseases and medical conditions. With 24 issued patents and over 150 installations, NKI’s FDA-cleared I-Portal® devices are sold to physical therapists, audiologists, ENT’s, neurotologists, neuro-chiropractors, neuro-ophthalmologists and neurologists around the globe. The company's cleared diagnostic platforms include the I-PAS® (I-Portal® Portable Assessment System), I-Portal® NOTC (Neuro-Otologic Test Center), I-Portal® VNG, (Video Nystagmography) and I-Portal® VOG (Video Oculography), along with related accessories, software, training and support services. 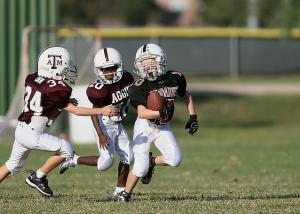 Concussions, as mTBI’s are widely known, are an increasing public health concern. The need for an objective diagnostic device has made health care practitioners eager for a system that can measure concussion symptoms acutely and over time with speed, precision and reliability. Recent third-party research initially indicates a battery of OVRT (oculomotor, vestibular, and reaction time) tests, in combination with NKI’s I-Portal devices, can support a more accurate diagnosis of mTBI (concussion) symptom measurement both acutely and during convalescence. Please refer to NKI’s website and the resources page for papers reporting on I-Portal’s role in various concussion studies. NKI is actively working toward gaining clearance for its I-Portal® systems as an aid in the diagnosis of concussion based on this and other research. To learn more about NKI, please visit www.neuro-kinetics.com. From warm-water pool therapy to their especially designed and unique equipment, River has clients covered for an efficient and effective treatment plan. Pediatric, school-age services, in particular, are designed to heighten the sense of joy and accomplishment and to optimize the benefits of the natural environment. This is achieved by consulting in the child's school, home, preschool, or day care, and by helping their teachers, caregivers and family members to become a part of the process in reaching the child's goals. Combining nearly 20 years of experience with friendly and caring service, River Therapies focuses on your therapy needs in a positive and fun atmosphere! To learn more about River Therapies, please visit Riverpediatric.com. SALT LAKE CITY, UT, USA, February 21, 2019 /EINPresswire.com/ — The Cholangiocarcinoma Foundation (CCF) has partnered with Komodo Health to create an interactive map for patients to find healthcare providers experienced in cholangiocarcinoma, nationwide. Patients may access CCF’s Specialist Finder here. Cholangiocarcinoma, a cancer of the bile ducts, is often labeled a silent disease because many times the signs and symptoms go unnoticed until the cancer is in the advanced stage. Even when early signs and symptoms become known, they may be vague and easily attributed to another disease. Approximately 9,000 new cases are diagnosed each year—and these numbers are growing as cholangiocarcinoma has the second highest rising incidence rate amongst all cancers. “Our patients struggle to find healthcare providers that provide the best standards of care for cholangiocarcinoma,” Stacie Lindsey, CCF Founder and President said. “Komodo Health’s healthcare map creates access for CCA patients to healthcare providers that are experienced with cholangiocarcinoma” Stacie continued. Komodo Health and the Cholangiocarcinoma Foundation began their partnership in May of 2018. The agreement allows the Cholangiocarcinoma Foundation to access disease-specific insights to help get cholangiocarcinoma patients the right care at the right time. “Specialist Finder will connect patients with the best standards of care and reduce the burden of this deadly disease.” Said Dr. Aswin Chandrakantan, Head of Product and Chief Medical Officer of Komodo Health. Local nonprofits are attending a complimentary networking event at the Clearwater Community Volunteers Center in Downtown Clearwater. Pictured here is Lynn Posyton of the Concerned Businessmen’s Association addressing the group. 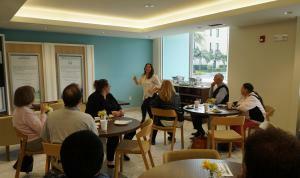 CLEARWATER, FLORIDA, US, February 21, 2019 /EINPresswire.com/ — On February 27th, The Clearwater Community Volunteers (CCV) Center is hosting its monthly networking event for nonprofit organizations from the Tampa Bay Area. After a talk by Lynn Posyton, board member of the Concerned Businessmen’s Association of Tampa Bay, charities will have the opportunity to form new partnerships by networking with other like-minded nonprofit organizations. The event starts at 11:00am, is complimentary to nonprofits and an assortment of refreshments will be provided. Ms. Posyton will educate guests on how to get people to contribute toward their group’s charitable cause. To find out more about the Clearwater Community Volunteers Center or to RSVP for the upcoming luncheon please call Michael Soltero at (727) 316-5309 or email ccvcenter@ccvfl.org. Mr. Christopher King, founder of the Gentleman’s Course and human rights advocate, speaks on Human Rights in Tampa Bay. CLEARWATER, FLORIDA, US, February 21, 2019 /EINPresswire.com/ — The United for Human Rights (UHR) Florida Center, located at 29 N Fort Harrison Avenue in Downtown Clearwater, is inviting the public to learn how to combat human rights abuses with a seminar on March 2nd at 1:30pm. It will focus on the local problems of homelessness and how anyone can be a part of the solution. This seminar is one in a series of seminars held by the UHR Center to educate the community on how to solve situations ruining their areas. One of the situations UHR wants to tackle is homelessness. In Pinellas County there are nearly 12,000 homeless, and over 1,200 of those are children. Homelessness is just one human rights problem that Florida encounters every day. The Universal Declaration of Human Rights says in Human Right #25 that everyone has the right to food and shelter. The UHR Center opened its doors in July of 2015 when the Church of Scientology sponsored its brand new center in the heart of Downtown Clearwater. The Center hosts a variety of seminars, discussions and events to raise awareness on what human rights are and how to secure them. The center is open every day from 10am to 10pm. For more information on United for Human Rights or to attend a human rights event, please contact Cristian Vargas at 727-265-7479 or email cristian@humanrights.com. Follow their social media on Facebook, Twitter and Instagram @UHRFlorida. 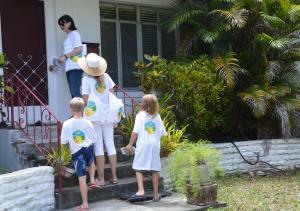 Volunteers going door-to-door distributing The Way to Happiness booklets in Clearwater. CLEARWATER, FLORIDA, US, February 21, 2019 /EINPresswire.com/ — On February 2nd, 2019 volunteers from the Way to Happiness Association Tampa Bay went door-to-door in Clearwater’s Gateway neighborhood, informing residents of the initiative to make Clearwater the safest city in the US by distributing a booklet called The Way to Happiness, a non-religious moral code written by L. Ron Hubbard. According to city-data.com, Clearwater’s crime index is currently 20% higher than the US average. With this in mind, The Way to Happiness Association Tampa Bay volunteers have been distributing the booklets to homes in beleaguered neighborhoods in order to increase mutual trust between residents and reduce crime. For more information about the program or how to obtain materials for your community please visit The Way to Happiness Community Center on 33 N. Fort Harrison Ave, Clearwater FL 33755, or call: (727) 467 6961. The Center is open daily from 10am – 10pm. The Way to Happiness Association Tampa Bay is sponsored by the Church of Scientology. 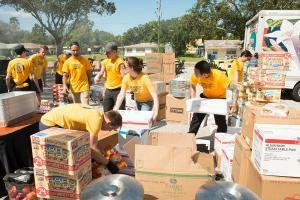 Scientology Volunteer Ministers distribute supplies in a disaster-ravaged neighborhood. CLEARWATER, FLORIDA, US, February 21, 2019 /EINPresswire.com/ — Every Tuesday evening at 7:30, the general public is welcome to attend a series of free workshops based on the Scientology Volunteer Ministers Tools for Life film. 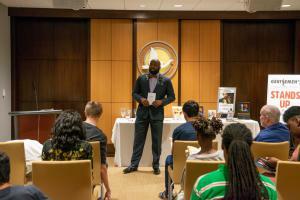 Seminar topics include: how to get rid of toxic people; how to be better organized; how to achieve one’s goals; and how to be a better parent. These seminars are hosted by the Scientology Volunteer Ministers (VMs) of Florida at their center, located at 101 N. Fort Harrison Avenue in downtown Clearwater. The seminars last about an hour and refreshments are served. To learn more about the Scientology Volunteer Ministers, or to reserve your seat at an upcoming seminar, please call (727) 467-6965 or email the center at cwcentermanager@volunteerministers.org. Whether serving in their own communities or on the other side of the world, the motto of the Scientology Volunteer Minister is “Something can be done about it.” The program, created in the mid-1970s by L. Ron Hubbard and sponsored by the Church of Scientology International as a religious social service today constitutes one of the largest and most visible international independent relief forces, with more than 200,000 Volunteer Ministers around the world. "Thus, a Volunteer Minister is a person who helps his fellow man on a volunteer basis by restoring purpose, truth and spiritual values to the lives of others.” Hundreds of thousands, Scientologists and others, have been trained in person or online in a wide range of skills that use Scientology fundamentals to bring relief from physical, mental or spiritual suffering and improve any aspect of life—communication, study, marriage, parenting, dealing with stress, being successful in the workplace, achieving goals and many more.